This product is no longer available and has been replaced by: RF320. The RF310 is a rugged, narrowband VHF radio transceiver for customers with an FCC-assigned frequency in the range of 148 to 174 MHz. 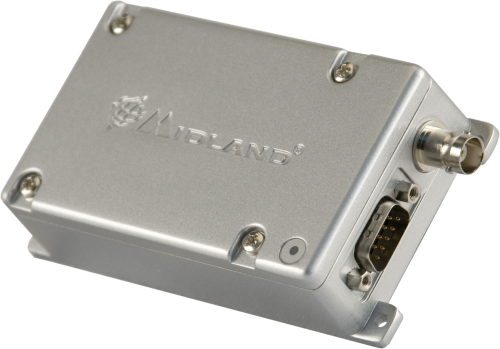 It is well-suited for Campbell Scientific RF networks. An FCC license is required. The RF310 is programmed by Campbell Scientific to the frequency that was assigned by the Federal Communications Commission (FCC). This frequency must be specified at time of order so that it can be programmed into the radio. A user-supplied antenna that matches the FCC-assigned radio frequency is required for each radio. Typically, the COAXNM-L coaxial cable is used to connect the antenna with the radio. One end of the COAXNM-L includes a male BNC connector that mates with the radio's BNC connector. The other end of the COAXNM-L includes a Type N Male connector that mates with the antenna's connector; the majority of VHF/UHF antennas terminate in a Type N Female connector. Besides the radio, each field station and repeater station must also have an RF500M Radio Modem or RF310M Radio Modem; base stations need an RF500M modem, RF500B Base Station, or RF310B Base Station. The RF System brochure provides a complete list of equipment used in our field stations, repeater stations, and base stations. CR206X (retired) The CR200(X)-series dataloggers are only compatible if the RF500M radio modem is used. CR211X (retired) The CR200(X)-series dataloggers are only compatible if the RF500M radio modem is used. CR216X (retired) The CR200(X)-series dataloggers are only compatible if the RF500M radio modem is used. CR295X (retired) The CR200(X)-series dataloggers are only compatible if the RF500M radio modem is used. The RF310 does not work with other radio models.